In India and other parts of Asia, gourds are grown as food rather than just as decorative fruit. They are all Members of the cucumber family, known as cucurbits. All of these vegetables produce vines that run along the ground or climb. It is best to train them on a trellis or fence, thus keeping the fruit off the ground. You can plant seeds in the summer directly in the garden after all danger of frost. Alternatively seeds may be started indoors 6-8 weeks before your 1st frost free date. 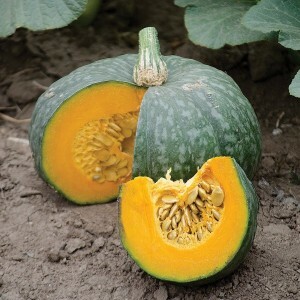 Cucurbits need full sun and well-drained soil in order to thrive. Before planting, add organic matter for best results. Cucurbits produce separate male and female flowers, but they both occur on the same plant. To distinguish the male flowers from the female flowers in cucurbits, look at the flowers closely. It is behind the flower where the differences between male and female flowers can be observed. Behind the flower,the female flower possesses an ovary that looks like a miniature version of the fruit that will eventually form. Pollen must be transferred from the male flowers to the female flowers to obtain fruit. Pollen transfer is done by bees and other insects. If necessary, one can hand pollinate female flowers transferring the pollen from the male flower using an artist's brush. 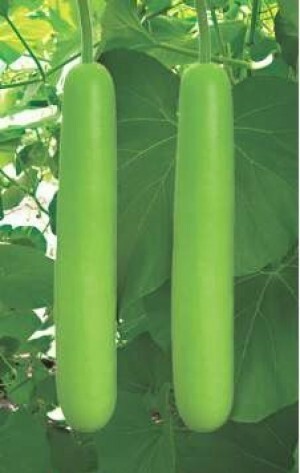 (Lageneria siceraria) Bottle gourd, also known as bottle squash, calabash gourd, Doodhi, or Lowki is a delicious vegetable that has many uses. Its delicate nutty flavor adds greatly to hot curries as well as cooling yogurt dishes like Raita. It can be used like squash but it has a firmer, crisper texture. 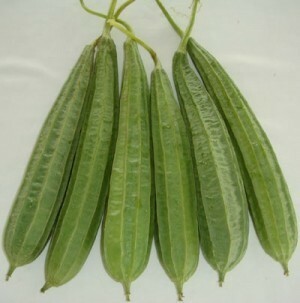 Alok is a light green variety, with uniform straight tender fruits, 1 to 1.5 ft long. 15- 20 seeds/regular pkt. 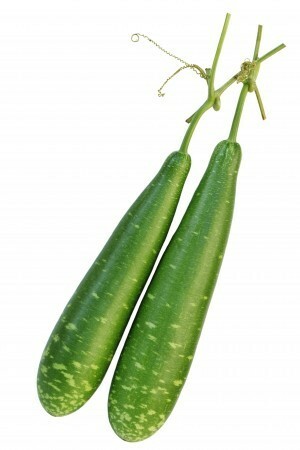 A shorter variety of Bottle gourd with all the same delicious flavor. Characteristics: Early maturity, vigorous growth, with relative resistance to powdery mildew. Strong fruit setting ability, can set many fruits on large vines. Matures in about 50-55 days from sowing to harvest, long harvest time, light green fruits, drum shape, fruit length is about 20-25 cm, single fruit weights about 500-700 g.
Tender flesh, slow to age, resistant to storage and transportation, good commodity, super high yield. 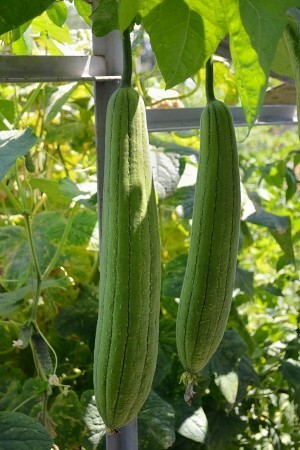 Compact variety of hybrid bottle gourd with an average weight of just 1.7 Lb, and 6 in long by 4 in wide. Ready in 50 days from sowing. High performing Hybrid. Vigorous plants with prolific bearing habit. 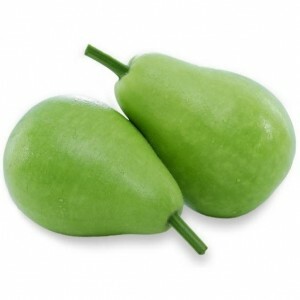 Fruits are tender and cylindrical 1 ft. long fruit weighing 1.5 Kg. The rind is smooth, dark green with white specks. The flesh is white with slow seed maturity. It is a heavy yielder. (Lageneria siceraria) A globe shaped variety that produces melon sized fruit, with all the flavor of the longer varieties. 15- 20 seeds/pkg. 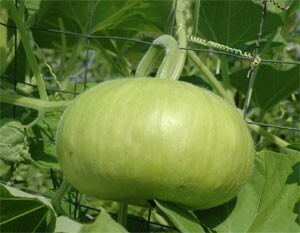 (Citrullus vulgaris) Also known as apple gourd. The very tender and tasty fruit are flat round in shape and weight 3 to 4 ounces at harvest. 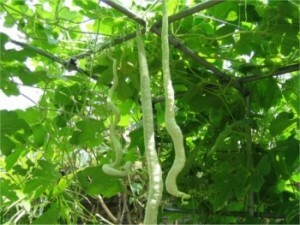 Prolific vines grow 40 to 50 inches long and have hair on the stems and leaves. 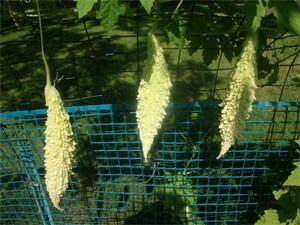 Flowering begins at 30 to 35 days and first harvest follows 15 to 20 days later. Prepared in India in a number of ways: cooked with curry or served with eggplant, peas, potatoes or other vegetables. Good source of Vitamin A. 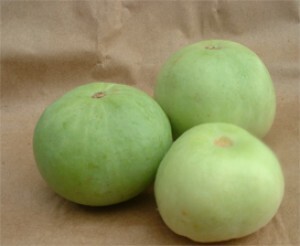 A hybrid variety that has round, darker green fruit than regular variety Jaya. A prolific yielder that is tender and tasty with delayed seed development. 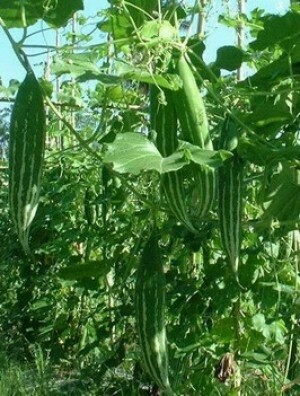 (Benincasa hispida) Also known as Wax gourd, winter melon, fuzzy melon, and hairy melon. The fruit is covered by a white, chalky wax which deters microorganisms and helps impart an extraordinary longevity to the melon. Winter melon fruits can be stored for as long as a year without refrigeration. 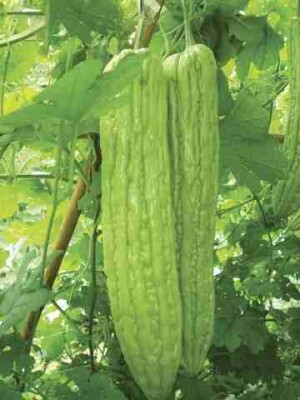 Ash gourd can be used in many variety of dishes from curries to soups to candies. 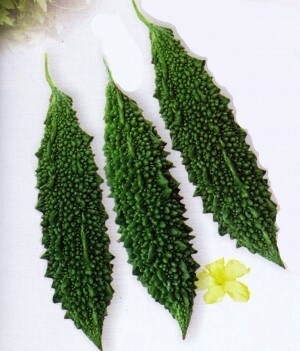 (Momordica charantia) Bitter gourd or karela, also known as bitter melon in the Chinese markets, is a delicacy that is nutritious and is renowned to have medicinal qualities. It can be fried, stuffed, pickled, baked or curried. Varieties of this vegetable include those with very light, almost whitish green skin to the dark bottle green colored skin. Some are almost a foot-and-a-half, while others are just about 2"-3" long. Cooking this vegetable seems to reduce some of the bitter taste. Jawahar is emerald green, 7-8" fruit, quite bitter, a heavy yielder bearing 55-60 days from sowing. Vigorous plants with prolific bearing habit. Starts fruiting in 45-50 days after sowing. Fruits are long (9-12") with dark green shining skin having sharp tubercles. It is a heavy yielder with good transport qualities. Glossy Indian type bittergourd. (Momordica charantia) This particular hybrid is white in color with good teething. Fruit length is approximately 25 cms. and it is very productive and attractive. Oriental type bittergourd that is less bitter than the Indian varieties. A very high yielding high quality hybrid. The plants are vigorous and early. 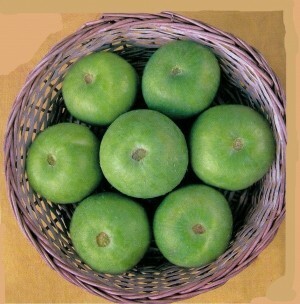 Fruits are shiny light green with continuous attractive ribs and few bubbles. Fruits are 15 inches in length with blunt end and weighing upto 1.5 lbs. 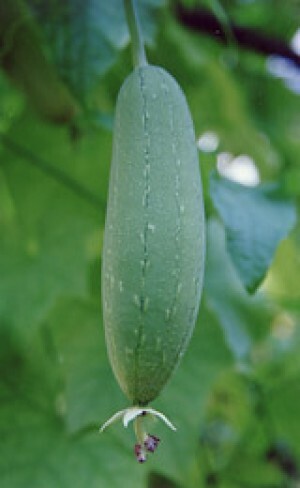 Ridgegourd (Luffa acutangula), or turiya is another easy gourd to grow and is a versatile vegetable that adds a new dimension to vegetarian cuisine. 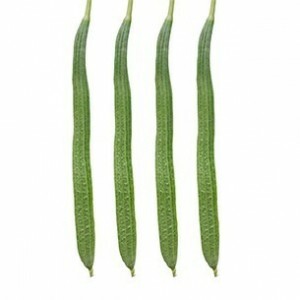 Rishi is a long, slender, variety shiny green with prominent ridges. The fruit is 15-17" long and even in width. Also known as Chinese okra. Approx 20 sds/pkg. 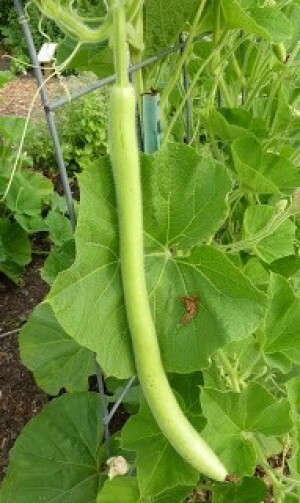 Ridge gourds have a long growing season of 100 to 180 frost-free days until harvest. If you live in an area with short growing season, you can start seeds indoors four weeks prior to transplanting outdoors. is an edible type of winter squash with a bulbous shape. It has a sweet, nutty buttery taste that is similar to pumpkin or sweet potato. It has a salmon-yellow skin and orange flesh. As it ripens, it turns increasingly deep orange, and becomes sweeter and richer. 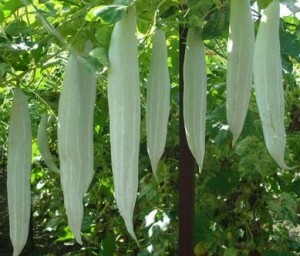 It grows on a vine, so support should be provided. 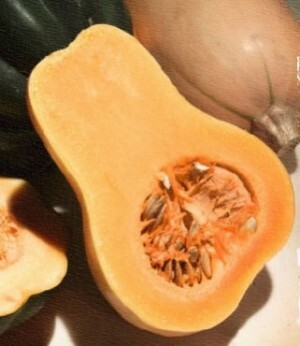 Butternut squash can be roasted, pureed or mashed into soups, casseroles, breads, and muffins. It is notable for its ability to be stored for long periods when stored in a cool dry place. T,OP Approximately 20 seeds/pkt. Vigorous vines that produce fruit in 45-50 days. 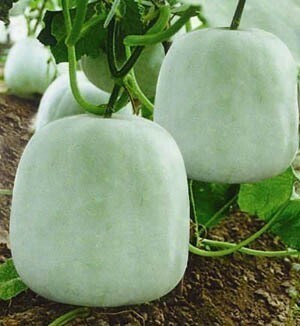 The uniform gourds produced are white and medium in length and weigh between 12 oz to 1 pound each.